Onchain CEO Da Hongfei introducing the Onchain Framework to a crowd. First open-source universal blockchain framework Onchain announced in a press release sent to CoinReport that its consortium chain product, the Law Chain (technology originates from Antshares), will deliver technology for Alibaba’s Ali Cloud, the world’s first blockchain-powered email evidence repository. 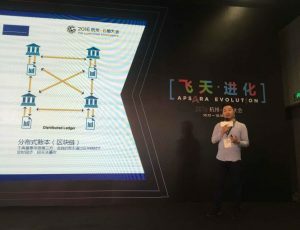 Ali Cloud, Alibaba’s cloud computing branch, talked about the partnership at its annual cloud computing conference, Yunqi Cloud Conference, in Hangzhou, China. Ali Cloud gains a bottom-layer framework, including the open-source blockchain proficiencies, which enable any business to modify its own enterprise-level blockchain with adapted functionalities, from Onchain. One of the most commonly utilized communication tools in the corporate world, email is used as evidence in courtrooms and is recognized by judiciaries. However, until now, it has been problematic to pull out original email files as digital evidence due to the time, resources, inter-departmental cooperation and technology needed. Ali Cloud’s blockchain-based email evidence repository will enable users to synchronize and store vital data (along with hash values) of significant emails to third parties. Users, in case of dispute, can download the emails in question and send them to judicial departments, which can then review the emails and their data to develop reports as evidence in a courtroom. Onchain recently received the Award for Excellence in Innovation in Blockchain Technology from Frost & Sullivan. It was also named a KPMG China Leading Fintech 50 selection.